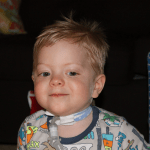 CAN A PERSON BE WEANED OFF A VENTILATOR AND TRACHEOSTOMY AT HOME? 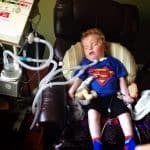 A question we get quite frequently by our readers and also by our clients is if intravenous nutrition, also known as TPN (total parenteral nutrition) can be given at home? TPN or Total Parenteral Nutrition is intravenous nutrition that can only be given via a central venous catheter (CVC) or via a PICC (peripherally inserted central catheter) line. Fairly often Patients in Intensive Care have to be nil by mouth (NBM) for situations like intubation, abdominal surgery, ileus (bowel obstruction), Nasogastric or PEG feed intolerance to name a few. Whenever nasogastric feeds or PEG feeds can’t be given to meet nutritional demands, TPN or total parenteral nutrition needs to be given via a central venous catheter (CVC) or a PICC (peripherally inserted central catheter) line in order to meet nutritional demands. There can sometimes be a 24 hour time window between stopping PEG or Nasogastric feeds and commencing TPN depending on the availability of TPN. Sometimes Pharmacy needs to prepare TPN first. Once TPN has been commenced, regular blood tests including the check for blood Glucose and Electrolytes needs to be monitored. 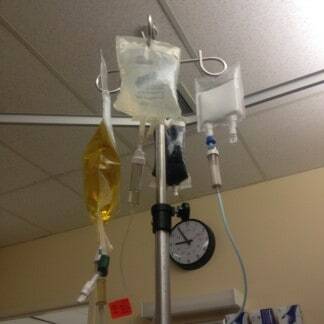 So what about giving TPN at home? Given that a service like INTENSIVE CARE AT HOME is providing care to ventilated, tracheostomised and otherwise medically complex Patients with 24/7 Intensive Care and paediatric intensive care nurses as a genuine alternative to a long-term stay in intensive care, the provision of home TPN is also part of our skill set. 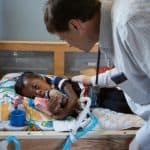 We are currently providing home TPN to paediatric clients and have also provided services to adult TPN clients at home. 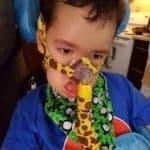 The delivery of home TPN requires the skill and expertise of an Intensive Care nurse, due to the skills that are required when it comes to the central venous catheter (CVC) or PICC line management. The risk that needs to be managed is the patency of the central venous catheter (CVC) or PICC line. The CVC or PICC line also need to be re-dressed sterile on a regular basis in order to avoid line infection that could develop into sepsis. Once the line is blocked it requires a re-insertion of the CVC or PICC line which is a procedure that needs to be performed in hospital, sometimes under ultrasound or even under x-ray guidance.